Leverage your mobile computing strategy and add world-class data collection capability in an economical way. Provides the peace of mind that the investment you make today will serve your business needs tomorrow. With AutoMac* and our patent-pending breakthrough antenna design, you get maximum read/write speeds and coverage required to maximize workforce efficiency. Our unique power-optimizing algorithm delivers the superior battery cycle times that ensure full-shift power, even with intensive usage. Enable a real-time wireless connection to your mobile or backend systems via Bluetooth 2.1 or later. 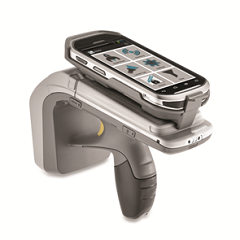 If a wireless connection is not available, batch mode enables the collection of up to 500 bar codes and/or 40,000 RFID tags. Just sync to upload the data from the RFD8500 to the host device at any time. Permanently attach to a compatible mobile device to create a dedicated inventory management device; temporarily attach to enable RFID when and where you need it on the mobile device of your choice, bringing comfort to inventory management tasks; deploy as separate devices — workers can put the host mobile computer in a pocket or on a desk to protect the device and create a lighter RFID solution.